Per typical for us, planning for our latest road trip began with a couple of destinations in mind, then grew organically as we thought of more things to do and then strung it all together. When all was said and done, we were gone 50 days, traveled over 8,500 miles, visited 14 states and 4 provinces (Canada). The primary impetus for the trip was to visit our friends Sted and Robin, who invited us to spend a couple of weeks with them on their island on Georgian Bay, in Ontario, Canada. Yes, they have their own island and compound where they’ve spent every summer for the past thirty years. Sted and Robin also have a home in Annapolis, MD, which they generously opened to us while our son attended the Naval Academy, and which basically became our second home for four years. Sted and my husband rowed crew together as midshipmen at the Academy, but we became close friends with them during our son’s stint in Annapolis. During the many hours we spent with Sted, he spoke tenderly about Georgian Bay. His grandparents and parents owned lake cottages there, and he recalled how summers in Canada were his fondest memories from childhood. Many friends and relatives from Cincinnati, OH (his hometown) also summered there. 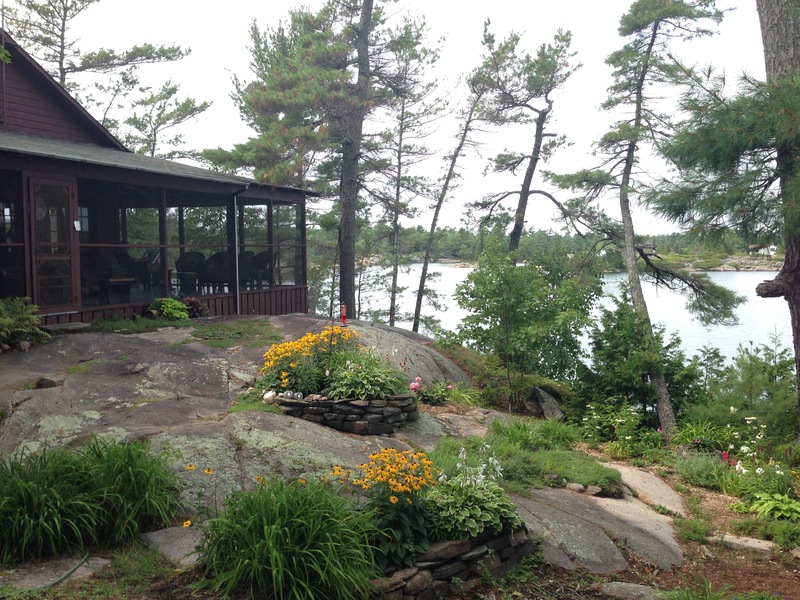 Shortly after turning 40, he talked Robin into buying their own place on Georgian Bay, and they have spent every summer there since. Their four kids and 7 grandchildren grew up going to the island. It was always clear to me that Georgian Bay is key to Sted’s heart, and only by visiting would we truly know him. With that in mind, and dearly missing Sted and Robin since our son graduated, we accepted their invitation to visit the island this summer (not an easy proposition since we live in Southern California). In late July we left home for our trek across country on the Lincoln Highway (see my previous post The Lincoln Highway for that part of the trip). 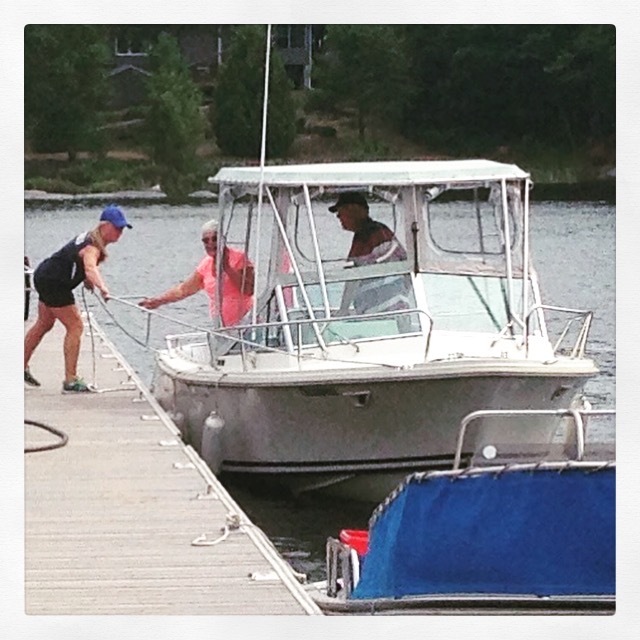 On August 11, we pulled into the marina at Pointe au Baril, ONT, parked our car, and waited for Sted and Robin to pick us up. Ten minutes later, they appeared in their 20-ft motor boat, loaded our suitcases and took us to the island. After hearing so many of Sted’s island stories, I had a mental picture of the place, but didn’t know exactly what to expect. I had imagined a bay, with the various cottages in a rather straight line along the water. 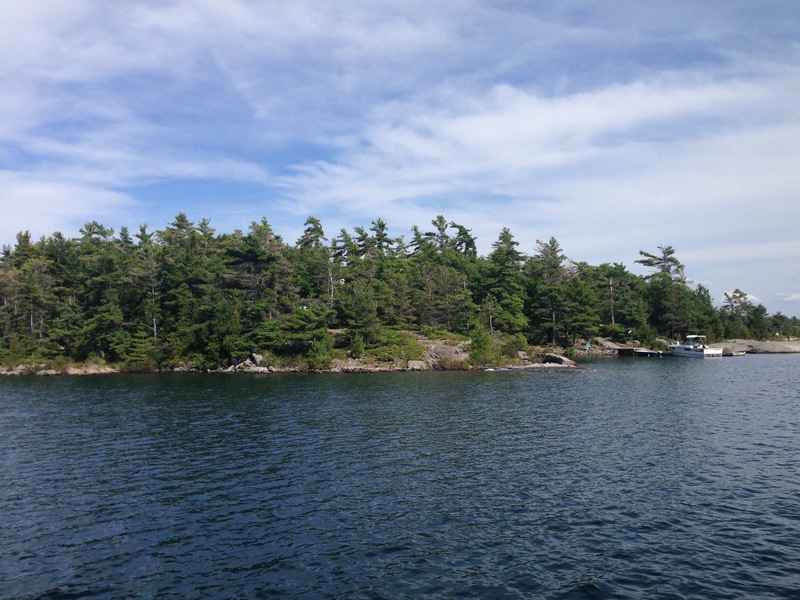 Instead, we discovered a vast body of water (Lake Huron) with inlets and islands dotting the bay, requiring navigation through a maze of twists and turns. Their island compound was about what I expected, but more comfortable, although not at all ostentatious. There was a dock for the boats, then a short walk up to the main cabin (where we stayed). They have two small guest houses (for their two daughters with kids) and their own small cottage on the opposite side. We spent 12 blissful days on the bay, and got a real taste for island living. Every morning, my husband would go down and take a dip off the dock (it was a little too chilly for me, but I never tired of telling him to go jump in the lake). We woke at our leisure, made our own breakfast and lunch, and then had dinner together. There was no TV, and unless we had something planned, we spent our days reading, writing, talking, or napping. One day, we took Sted’s large boat out to Western Island harbor, jumped in the water, and grilled hamburgers and hot dogs onboard for lunch. Another morning, my husband joined Sted’s mens’ kayaking group for a morning paddle. As I waited on the dock to take pictures, I was astonished to see an armada of old guys in kayaks sweep around the bend. Later in the week, I reprised most of kayak route with my husband and Sted. The up-close views of the landscape and wildlife were breathtaking from the quiet of a kayak. Another beauty of life on the bay is that, as an alternative to the solitude of the island, one can enjoy an active social life. During our time with Robin and Sted, we accompanied them to two cocktail parties, one dinner and a morning Bible study on other islands. We simply dressed up (a little), got in the boat, and motored over to the other island, where we were typically met at the dock by our hosts, who greeted us and helped tie up our boat. On our last Friday evening, Robin and Sted hosted a dinner party, and we spent a fair amount of time helping them prepare. We learned that menus are often driven more by what ingredients are available in the cottage, or at the small store at the marina. The only alternative is to take the boat to the marina, pick up the car and drive 45 minutes to the grocery store in the nearest town. As comfortable as our island stay was, we were appreciative of the hardiness and resourcefulness of the Bay community. Each island must be largely self-sufficient. They each have their own septic and power systems, and many don’t have electricity. Any large equipment for repairs or building must be brought in by barge. To go anywhere off the island requires a boat trip – day or night, good or bad weather – and most residents, from older kids to adults, are skilled in boating. Robin talked of her first few summers on the island, unfamiliar with water life, when she was basically left to fend for herself (when Sted had to return to work for several weeks) with four small kids and a boat. She learned ingenuity, but she also learned the mutual dependence of the community. We witnessed firsthand how the residents support each other, be it borrowing items, coordinating rides, or sharing information. On the morning that the guys went kayaking, Robin volunteered to make the coffee for their post-kayaking breakfast at a cottage with no electricity. We woke up early to start two large percolators, filled several large carafes with coffee, and waited with them on the dock for the hostess to pick them up in her boat. 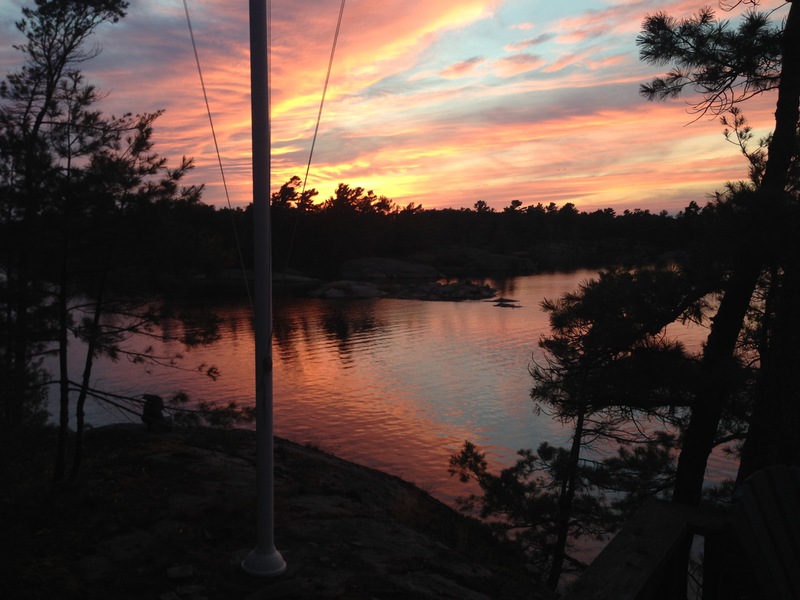 Our time on Georgian Bay was a gift on so many levels. It was beautiful and relaxing. It was a joy to spend time with Sted and Robin. It was fun to meet their friends and enjoy a taste of the Bay social life. Most of all, it was a profoundly special experience to be invited into, and enjoy, the cherished place of a dear friend’s heart.